I've had custard on my mind ever since I decided not to make last week's TWD selection of Floating Islands. I absolutely adore custard and while I wholeheartedly avoid the bright yellow goop that passes for custard at the supermarket, strangely I don't make it very often at home. 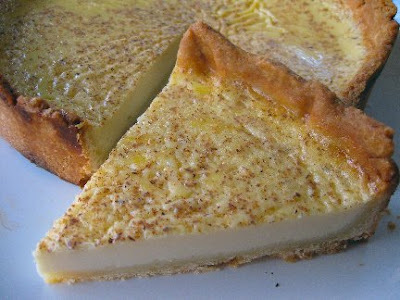 I decided it would have to be baked to pass my food safety limitations at the moment, so custard tart it was! What elevated this from the mundane was the fact I used whole fresh nutmeg for the first time. I know, where have I been?? Just like when first I tried a fresh vanilla bean, this was spectacular. We loved this tart. So simple and elegant and not too sweet. You can find the recipe I used here. The only change I made was to the pastry - leaving out the egg yolk and water, replacing them with just enough apricot juice to bring it together. This added a lovely subtle flavour and most importantly, meant I could eat some uncooked. I love pastry!!! this sounds good, i love apricots. 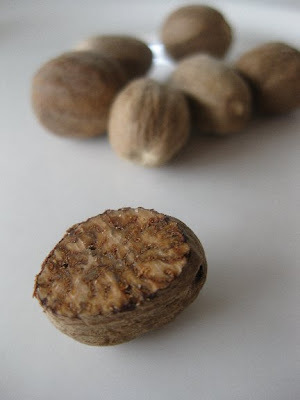 i've never used fresh whole nutmeg before, i've heard it makes such a difference.